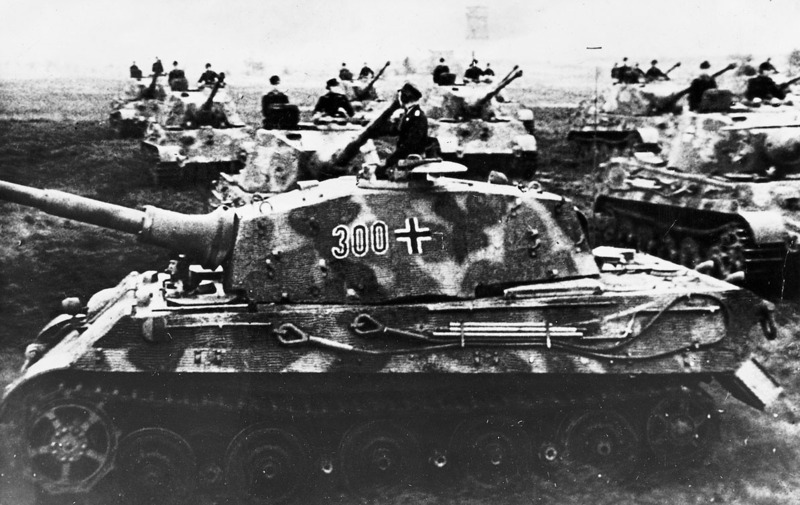 The result of a German Army Weapons Office demand for a redesigned Tiger with thicker armour, sloped plates and a powerful gun, the Tiger Ausf B, or “King Tiger”, entered production in December 1943. Henschel was the sole manufacturer of the vehicle, though the first 50 Tiger IIs completed mounted the turret of the rival Porsche design (with a curved front mantlet and a bulged commander’s cupola). Suspension was similar to the Tiger I, but the wheels were overlapped rather than interleaved to simplify maintenance problems. LIke the Tiger I, the arrangement gave good cross-country performance despite the vehicle’s weight. The Tiger II incorporated design features resulting from battle experience. The front plate, for example, was 150mm (5.9in) thick and set at an angle of 40 degrees, rather than squarely vertical as on the Tiger I, making it invulnerable to any enemy antitank weapon. Its KwK 43 L/71 gun was extremely potent and the vehicles were often covered with anti-magnetic Zimmerit paste to defeat magnetic mines. However, the Tiger II suffered from mechanical problems (many broke down and had to be abandoned by their crews) during the war and its low speed was a handicap in battle. Production ceased in March 1945, by which time a total of 489 had been built.